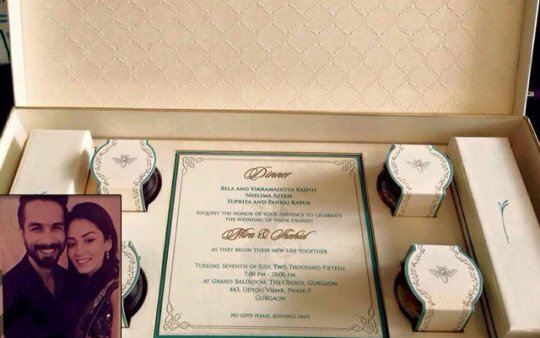 Putting an end to all the speculations about the actual date, Bollywood heartthrob, Shahid Kapoor and his fiancée, Mira Rajput’s wedding invite finally revealed it all. The invitation card of this gorgeous clearly showed their wedding date, which was July 7, 2015. The card was designed by Delhi-based designer, Ravish Kapoor, keeping in mind the brief given to him by Shahid himself, which was, ‘simple yet elegant’.